This 3-in-1 hardwood throwing tool will quickly become your most useful and favorite tool at the wheel! You will save time as you pick up and put down fewer tools when working at the wheel. 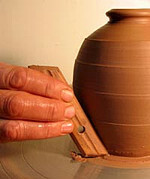 Use this tool to undercut a bevel at the foot of a thrown pot and then use the long beveled edges to rib your pot into shape. And use the pointed ends of the tool to groove design-lines around a form. Grooved surface keeps this tool from slipping from the fingertips and includes a hole for hanging up."